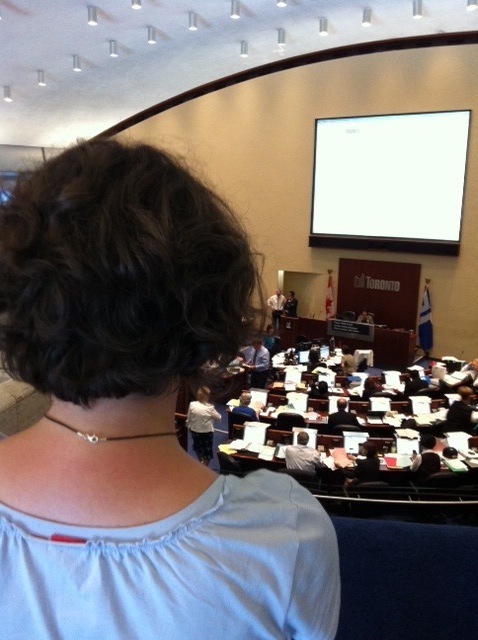 Andrea Garcia, Advocacy Director with the Toronto Cyclists Union, had already had a long day when I left Council at 7:00 pm. The vote on eliminating the Jarvis bike lane was scheduled for tomorrow morning, but was sneakily moved ahead to today. Garcia had taken this morning of in anticipation of a long, long day tomorrow – but when the news came that the vote had been jumped ahead a day, there was no time to lose. The Bike Union had already been promised the vote would happen at 11:00 am on July 12th, before it was pushed back to 2:00 pm. But this was a blessing: it gave the Bike Union a chance to mobilize. Tweets went out from Dave Meslin, NOW Magazine, Torontoist, and the Bike Union itself, and the message was the same: get down to City Hall as fast as you can! We need to show Mayor Rob Ford that Toronto takes cycling seriously. And they came: they came in the hundreds, packing the gallery in spandex and bike helmets, sitting through hours and hours of Councillor speeches on unrelated topics (mostly graffiti removal), patiently waiting for the debate on the bike lanes to begin. I learned from Garcia that while the Jarvis bike lane has stolen the show today, it is not the only piece of cycling infrastructure that Mayor Ford objects to. Slated for removal are bike lanes on Pharmacy Avenue and Birchmount Road, although because they are outside of the downtown core, they receive much less press. I asked her why Jarvis has become the emblem of Ford’s dislike of cycling, and she noted how frequently it came up during the election campaign. “Jarvis started the ‘war on the car’ rhetoric,” Garcia argues, despite how successful the bike lane on Jarvis has been for commuter flow. A study on the effect of the bike lane on cycling and car traffic found that cyclists’ use of the road tripled with the installation of the bike lane, while car traffic remained the same. No better for cars, but the study found no worse, either. And tripling cyclists use of a road while not impacting vehicle access is “a good sign that the street is functioning well for everybody,” as far as Garcia is concerned. I tend to agree. Shortly after Ford was elected Mayor, there was a murmur in the cycling community (and throughout the left-wing of the city, I would say) about how possible it would be to work with a Ford administration. Many felt that progress in the city on the Arts or cycling, for example, would grind to a halt, if not downright regress. When asked about the Bike Union’s policy towards working with Mayor Ford, Garcia went back to a plan issued by Councillor Denzil Minnan-Wong after the election which outlined Minnan-Wong’s cycling plan for the city as the new head of the Public Works and Infrastructure Committee. In response to the Minnan-Wong plan which called for an increase in protected bike lanes in the downtown core at the expense of bike lanes elsewhere, the Bike Union issued a statement saying cycling is not a political, left/right issue. They maintained that they would be willing to work with anybody who wanted to advance cycling in the City of Toronto, and to this end, collaborated with Minnan-Wong to tinker with and improve his plan before pushing it forward. It is now before council, but has been overshadowed by the Jarvis issue. And the Jarvis issue has emerged as a stand-in for the larger tension between a transportation vision of the City as a place for vehicular traffic primarily; and a vision which sees what are now considered ‘alternative’ modes of transportation as increasingly mainstream, and decidedly less ‘alternative’. And step one is to lose this dichotomy which sees anything that is not vehicular traffic as somehow abnormal or ancillary. To those who push for the removal of the Jarvis bike lane, it is worth considering that the Ford plan will not bring back the two-way centre lane: rather, it will see the removal of the bike lane and the introduction of a left turn lane. That is all. And if this seems a petty reason to remove important cycling infrastructure, that’s because it is. Councillors could be overheard this afternoon stating that this was politics – pure and simple. It is part of a larger drive of the right-wing Ford administration to simply undo the remnants of former Toronto Mayor David Miller’s time in office. The debate in Council lasted long after I left, although I put in several good hours of waiting and waving my hands when a Councillor said something rational. (Since the public is not allowed to make noise, they encourage jazz hands instead.) And, as predicted, in a final act of spite, the decision to put the motion to a vote was postponed to tomorrow morning, July 13th – the original time they had scheduled the vote for! Part II will conclude tomorrow with the results of the vote, and more from the Toronto cycling community and the left in general on what is to be done in Rob Ford’s Toronto.